For smokers looking to kick the habit, e-cigarettes are twice as effective as nicotine patches or gum in helping them get there, a new study says. The British study, reported last week in the New England Journal of Medicine, found that 18 percent of smokers who used vaping devices were able to quit the use of combustible cigarettes for one year, compared to 9.9 percent of people who used nicotine replacement therapies to quit. In the United States and Great Britain, cigarette smoking is the leading preventable cause of death, taking some 480,000 lives each year in the U.S. and more than 100,000 in Britain. The upside for vaping was its effectiveness in helping smokers stop using combustible cigarettes. The downside, the study found, is that people who switched to e-cigarettes were far more likely to continue vaping, exchanging one nicotine delivery system for another without ever kicking the habit. The study randomly assigned 886 people in Great Britain who were looking to quit smoking. They received either a three-month supply of a nicotine replacement treatment of their choice – patches, gum, lozenges, sprays, inhalators, or a combination – or a vaping starter pack with one or two bottles of nicotine-containing liquid. An accompanying editorial in the New England Journal of Medicine urged caution. 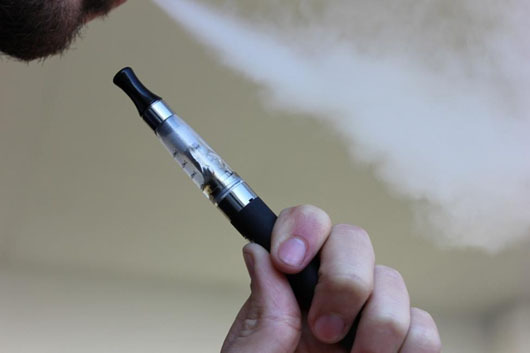 The ongoing vaping habit among those in the e-cigarette arm of the study “raises concerns about the health consequences of long-term e-cigarette use,” the editorial added, noting that “e-cigarette vapor contains many toxins” though the levels and their effects are generally considered to be lower than those coming from cigarette smoke.